Humanitarian aid and humanitarian organizations have been constantly aiming to enhance efficiency and effectiveness of response. Standards, codes and frameworks have evolved. Still, long lasting dichotomy has plagued international humanitarian architecture. In recent times, there have been growing realization for the need to empower local communities and local organizations as they are the first to respond, better positioned to respond and last to leave, perhaps never to leave. Despite this much articulated fact, humanitarian financing remains severely lopsided with grassroots communities and organizations receiving only a fraction of what should be rightfully theirs. Since eye-opening revelations post Rwanda genocide, there have been many an attempt towards humanitarian reform. Every major calamity revived the global interest in reform, be it the Humanitarian Reform initiative post Indian Ocean Tsunami or the Transformative Agenda, after the Haiti and Kashmir earthquakes in 2010. However, evaluations of subsequent mega disasters indicated that desired changes couldn’t be brought through these processes. Most recently, during the World Humanitarian Summit, held in May 2016 UN Secretary General laid out his vision in his report One Humanity: Shared Responsibility and its annex, the Agenda for Humanity and called upon the international community to put local response at the heart of humanitarian efforts. To pursue this, Network for Empowered Aid Response (NEAR) comprising international and local NGOs was launched. 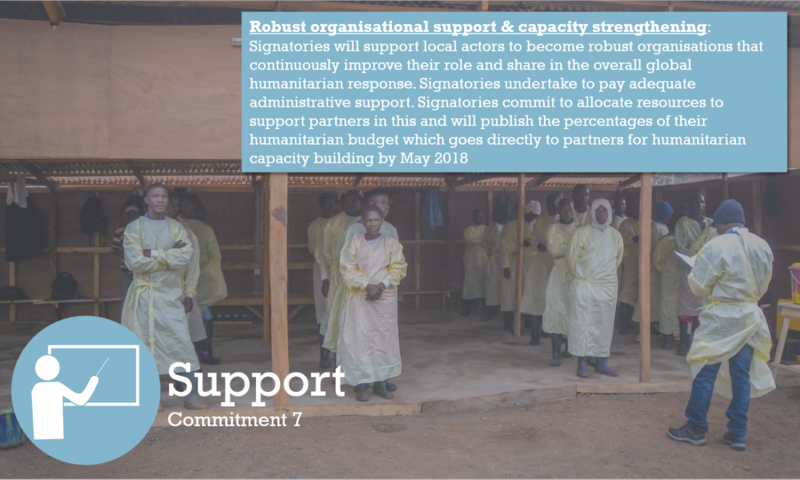 The summit also triggered Charter for Change that sets a specific target of 20% of humanitarian funding to be passed to southern-based NGOs by May 2018. The Grand Bargain (GB), another major outcome of the summit, seeks to make emergency aid finance more efficient and effective, committing to “a global, aggregated target of at Least 25% of humanitarian funding to local and national responders as directly as possible” and principled humanitarian action as local as possible and as international as necessary. Despite all such initiatives, there is a fear that existing power structures and complex dynamics within humanitarian fraternity may not help in realizing the vision of empowering local organizations through higher resource allocation. There is a need for a radical shift in humanitarian architecture. The HAI position paper is an attempt to make the localisation process more meaningful and HAI commits to pursue its mission of making pragmatic contributions to the ongoing debate and deliberations. According to World Disaster Report 2016, a total of 6,090 disasters occurred during 2006-2015. Out of that, 2,437 disasters occurred in Asia (40%), 1,471 in Africa (24%), 1,233 in Americas (20%), 793 in Europe (13%) and 156 in Oceania (3%). A total of 771,911 people died due to disasters during this period – 48,138 people (6.2%) in very high human development countries and remaining in the low human development countries, concentrated in Asia, Africa and Americas. According to Global Humanitarian Assistance Report 2016, around 677 million people – are estimated to live in countries that are either politically fragile, environmentally vulnerable or both. It is clear that maximum disasters occur in South which has also maximum concentration of vulnerability. Total humanitarian assistance in 2015 was USD$28.0 billion with most of this funding going to five countries suffering from protracted crises or hosting sizeable refugee population, namely Syria, South Sudan, Iraq, Palestine and Jordan. International aid, originating from government donors, is still largely channelled via multilateral organisations, mostly through six major UN agencies. In 2014 government donors channelled 64% (US$12.5 billion) of their funding primarily via UN agencies). Despite calls and commitments for more support to local actors, data from the Financial Tracking System (FTS) shows that funding channelled directly to local and national NGOs remained as low as 0.4% of international humanitarian assistance in 2015. Overall funding received by NGOs for humanitarian assistance in 2014 was US$8.0 billion, which was received directly as well as indirectly, in the form of sub-grants from other agencies. North-based INGOs received over three-quarters of that direct funding, almost half of which went to 10 largest INGOs. NNGOs, though widely recognised as having a key role to play in response, received a small proportion of the reported funding with local NGOs just receiving US$7.6 million. Clearly, there are many anomalies in humanitarian financing that has to be addressed at the earliest. Grand Bargain and Charter4Change (C4C) demand a major change with increased and direct funding to local NGOs and actors. This is easily said than done considering the existing dynamics in humanitarian financing and compromises involved perhaps starting with politically crafted definitions of ‘Southern NGOs or South Based NGOs’. Koenraad Van Brabant says in his paper LOCALISATION’: Meanings and Trajectories, “For some 50 years international development cooperation has been shaped by Western actors because they were the main providers of ‘aid money’. Perhaps ‘localisation’ signals, and will accelerate, a more international ‘international’ system? That is partially frightening, because a whole industry has been built on this in Western countries. But it may be inevitable – and will also open up powerful new perspectives and alignments”. MSF paper entitled The challenges of localised humanitarian aid in armed conflicts has given many caveats against localisation citing evidences mostly from conflict situations. Such attempts are patronising and patriarchal, an attempt not to let go cultivated power structures by citing lack of capacities, systems and conditions. While certain documents and charters have rightly identified the issue, the solutions offered are neither fresh nor inspiring to shift narratives around humanitarian actions. HAI believes that time has come to take hard and disruptive positions that challenges traditional norms and practises around humanitarian architecture in the areas of financing, capacities and human resources. There is a growing need to make the humanitarian system more effective, efficient and impact oriented. For this to happen, existing power relations, dynamics and status quo has to be consciously challenged. HAI believes that reform is possible through disruptive measures and is committed to work with the international humanitarian community, local organizations and communities to make this reform happen. While understanding and appreciating the existing constraints for direct financing to local organizations, HAI feels that the efforts should be to address such constraints to find appropriate resolution than highlighting such constraints to avoid bold financing measures. HAI calls for immediate measures to ensure channelizing humanitarian funding to local organizations either directly or through intermediary organizations under aegis of an interagency task force. HAI calls for annual tracking and reporting of funding to local actors. HAI calls for humanitarian organizations to challenge and overcome existing demand-supply based human resource optimization practises by looking at human resources as a critical component of sustainability and risk resilience at local levels. The purpose of humanitarian organizations shall not be to attract or poach talents locally, but to identify, nurture and establish such talents within local organizations towards a higher cause. HAI also calls for review of point 4 of the Charter4Change by not limiting staffing issues as compensation issues. HAI calls for broader understanding and outlook towards capacities, thereby creating a synergy between local and global organisations. There has to be realization that while local organizations will benefit from systematic and structured data-based approaches of international organizations, the latter also stands to gain from local organizations in-depth understanding of local issues, customs, traditions, dynamics and power structures. HAI calls for meaningful inclusion of local actors in all policy formulations and decisions. The humanitarian vocabulary should reflect a bottom up approach, reflective of traditional response mechanisms. With the understanding that traditional response mechanism need to improve through integration of modern technologies and system, HAI calls for a dedicated global fund, separate from response budget, to build capacity of local actors. With the understanding that now fundraising sphere is more expanded with emergence of donors in South, HAI calls for total transparency in local fundraising initiatives. Organisations, whether national or international, should declare their affiliations, origin, philosophy, staffing policy and operational framework so that donors can make informed choices. Humanitarian Aid International (HAI) is an Indian organisation, established by a group of highly experienced humanitarian and development professionals. HAI is an attempt to make the process of localisation more meaningful by bringing frontline responders at the forefront of discourse too. In India, our current focus is on building a national platform, consisting of national homegrown organisations, faith based institutions, corporate and media houses. The platform will respond to disasters with two purposes, 1) reduce response time to disasters in order to save more lives, 2) reduce operational cost of humanitarian responses, so that maximum resources are utilised on direct programmes. For further details, please visit the HAI website: www.humanitarianaidinternational.org or write to us at info@humanitarianaidinternational.org.